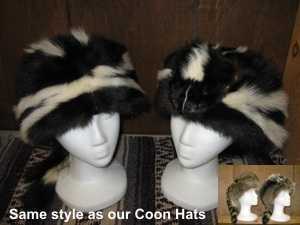 3 Pelt Skunk Hat. Traditional style with face and tail. My boyfriend LOVES his skunk hat! I received hat from wife for Xmas. Great Hat! Super warm, have worn it clearing snow in -30C conditions with -42C windchill, head sweats! I trapped 9 skunks, wife thought it was a great idea for me to have this hat! Got my skunk hat today and love it.